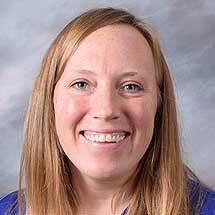 Dr. Dirks received her bachelor of science degree at Butler University in Indianapolis and her doctorate in Anatomy and Cell Biology at Indiana University. Her graduate work was completed at the Indiana University Center for Translational Musculoskeletal Research where she investigated the effects of exercise on bone health and focused her dissertation on the pathophysiology of tendinopathy. As Clinical Research Specialist, Dr. Dirks assists in the preparation of study proposals and Institutional Review Board (IRB) applications, monitors compliance of studies, coordinates with Trauma Program staff to retrieve data from the Trauma Registry as necessary for study completion, performs statistical analysis of data and assists in the preparation of abstracts and manuscripts for presentation and publication.